For many of us, when we think of braces the default image is likely to be braces on the outside of teeth, with prominent, metallic brackets (the part that attaches to the teeth) and then the arch wire connecting these brackets. This image might be enough to make us see braces as a necessary evil. They have huge benefits, but to get those benefits you have to put up with (potentially) a couple of years where the braces are very prominent. For adults and teens, options such as Invisalign have tackled this concern, so too have Lingual braces (braces on the inside of the teeth). Both have the effect of making braces far less visible, if visible at all; the wearer gets the benefits of braces without any concerns about their aesthetic look. However, Invisalign is not always suitable for children and Labial braces, those on the outside of teeth, are by far the most common. A different approach to tackling aesthetic concerns has been required and the answer is as simple as it is transformative. Colour. By adding colour to braces, children around the world have turned braces from a potential cause of embarrassment into a fashion statement. The reason for braces themselves is never a fashion statement, no orthodontist would allow a child who didn’t require a brace to have one fitted, but for those who do require realignment of their teeth, the introduction of colour allows them to express their own personality. The colour comes in the small pieces of elastic that work to attach the brackets to the wire and, as this is not a fixed part, it is possible to regularly change the elastic and with it the colour. Many children change the colour at every appointment. Children who want to add a splash of colour to their braces can have their pick from the complete spectrum – the choice is as varied as the variety in personalities. For some the choice is subtle, the same muted colour of elastic added to each of the brackets. Ceramic braces are also an option for children who do not want to make a statement with their braces. The colour of these coupled with white-coated arch wires helps them to blend in with the teeth. Others are bolder: bright neon colours are possible. A trend perhaps as popular among parents as the neon socks of the 1980s! A rainbow effect can be created, or any other variation of colour. Smilarly an Arsenal fan could have alternating red and white to show allegiance to their team. The playground conversation is easy to imagine. We have also seen children request colours and designs to match special occasions such as Halloween, weddings and bar mitzvahs. A quick search on social media shows just how much the trend has grown. Run a search for coloured braces on Pinterest, or Instagram or even just on Google and you will see hundreds or thousands of results, each of them a happy youngster posing for a selfie showing off their braces. On each platform, they are getting positive interactions with friends liking their posts. Braces have become something that can lead to positive self-image in the short and long term. Braces are obviously applied when there is a need for realignment. By adding colour, the vibrancy it lends becomes the focal point when looking at a wearer’s mouth, rather than simply the metal and the still-to-be-corrected misalignment. In Asia, so great is the trend that youngsters have resorted to wearing fake coloured braces, These are purely aesthetic and often fitted extremely badly, at times simply glued on. The trend is driven by the fact that so many young Asian stars proudly sport colourful braces. Social media has also driven greater awareness of famous global starts who wore braces in their younger days – Katy Perry, Cristiano Ronaldo and One Direction’s Niall Horan among them. 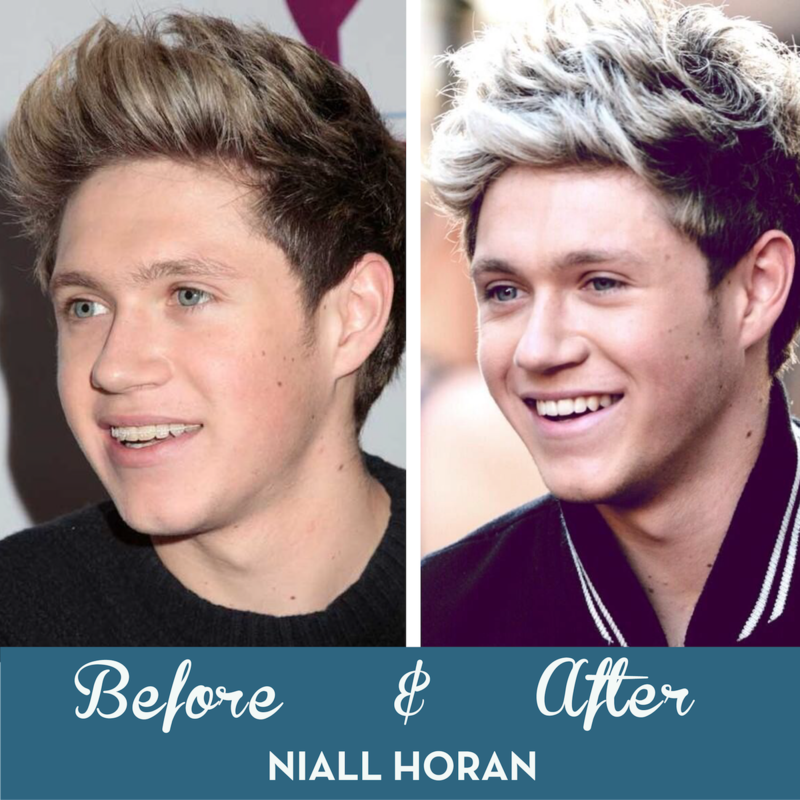 Niall even posted his before and after pictures to Twitter, a lovely idea that no doubt helped raise a smile among many young wearers of braces. We have already moved out of the days when braces had the danger of carrying a social stigma, now we are in a time when braces are a fashion statement and desirable. They have been embraced. At The Dental Surgery, we are experts in all aspects of orthodontics and while we would not claim to be experts in children’s fashion, we are able to add those splashes of colour to children’s braces. If you would like to discuss any aspects of having braces fitted, please do get in touch with us on 020 7680 1800 or visit our contact page. Signup to our newsletter to stay up-to-date with the latest dental health information and special offers from The Dental Surgery and our team of experts! Dermal Fillers v Anti-wrinkle Injections: What’s Right for You?